Mix a small amount of Devcon® 5-minute Epoxy. Apply a small amount of adhesive to the side of a light grey 8mm pearl. In a triangle pattern, press three white 2mm undrilled pearls to the adhesive to create the bunny's muzzle. Press two jet flat backs to the adhesive just above the undrilled pearls to create the bunny's eyes. Set aside to cure. 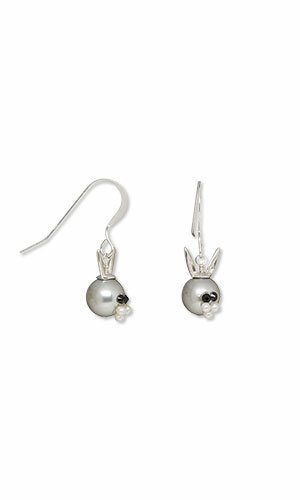 Repeat to embellish a second 8mm pearl. String an embellished pearl and a bunny ears bead cap onto a headpin then create a wrapped loop. Attach the loop of an ear wire to the wrapped loop.